You’ve selected a countertop material, color, and finish, but don’t forget there’s still one more thing to do: select the edge profile. Rock Tops Fabrication, Inc. is the premier custom countertop fabricator for homeowners and trade professionals in greater Baltimore and the surrounding counties, including the eastern shore of Maryland and Washington, D.C. Our state of the art equipment and Slabsmith digital templating can help you select the countertop edge style that’s right for you. Visit our showroom and fabrication shop in Owings Mills to see our vast array of style options. Eased edges are a great style for any kitchen and are especially appropriate for minimalist or contemporary designs where clean lines are key. Eased or beveled edges also work well with Arts & Crafts, Craftsman and Mission styles, traditional American and transitional kitchen designs. Eased edges corners are slightly rounded to protect the surface from chipping or damage, and the amount of rounding is variable. Bullnose edges can be simple or ornate. They soften the impression of the room and work just as well in a contemporary design or material like Icestone as they do in a classic design. Looking to the other design elements in your kitchen can provide some inspiration. Your edges should echo the curves of the cabinets or reflect the overall design of the space. Bullnose edges are easy to clean and a safer option if you are concerned about hips catching corners or little heads getting bumped. These range of style option for these profiles include a slight curve on just the top edge to a completely rounded countertop edge. Evoking a softer feel than square edges, curved edges compliment a sleek and modern vibe, but can also blend well with the classic American and European styles. If you wish to make a real statement with your kitchen countertops, an Ogee, Cove Dupont, or Triple Pencil edge will attract the attention you seek. Fancy edges are usually reserved for kitchen islands as they can become overpowering if used too abundantly. They make a marble or quartz island an elegant centerpiece of the kitchen. Select a fancy edge that suits your design but won’t overpower the overall design. These edges incorporate simpler edges into an entirely new design or create something absolutely unique. 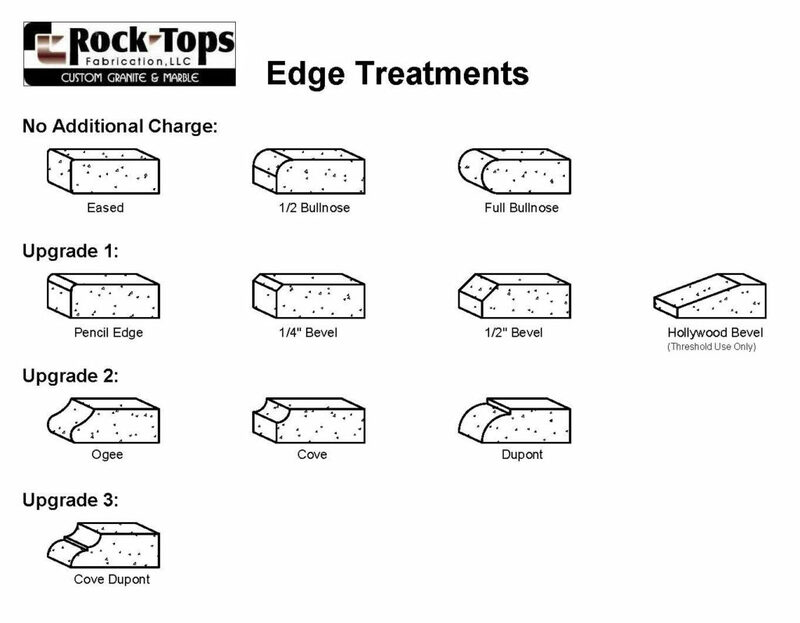 The machinery and tools available in Rock Tops Fabrication, Inc. factory allow for many unique edge designs. The potential for custom edge styles are limitless—contact us for a design consultation today!